I’m so grateful I asked for tips on making my pizza crust crispy earlier in the week. 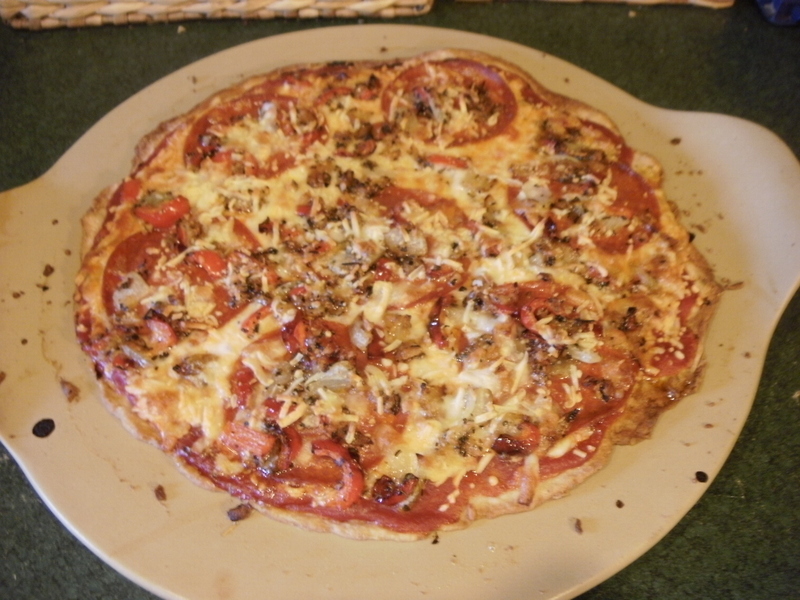 The problem wasn’t with the recipe I was using; it was that I needed a pizza stone! After asking for recommendations from y’all I went with a Pampered Chef stone, made in the USA of course (many of their products are made in China, but this is one exception)- it received many great reviews, and I like that it has… handles to make it a bit easier to grab from the hot oven. I made my 1st pizza with it last night using the same recipe I’ve been using for a while that I just couldn’t get to crispen up, and it turned out awesome! Being on a tight budget I hesitated for a minute at the $40 price tag, but know that this is something that will be used at least 2-3 times/month over the course of many years, and going out to eat at my favorite pizza place that uses local & organic ingredients runs ~$30/pizza so that helps put it into perspective. This recipe makes two 12” crusts. So we had pizza for dinner last night & I refrigerated the other ball which I’ll use to make a cold veggie pizza today or tomorrow. Obviously, cut the recipe in ½ if you don’t want extra. Preheat oven to 450. Mix crust ingredients together, press onto your stone/pan & bake crust by itself for 10-12 minutes or until just starting to turn golden brown. Remove from oven & add your favorite sauce & toppings then stick back in oven until golden brown. Seriously- it couldn’t be much easier! The pizza in the photo is our standard: I lightly sauté onion, red pepper & garlic with some herbs, add on top of some Applegate pepperoni & Organic Valley mozzarella & that’s it. This turned out so delicious. My other favorite combo is caramelized onion, spinach & feta, but as we all know: the sky’s the limit when it comes to pizza making! I followed this recipe from Whole Foods pretty closely, plus or minus a few of the herbs & spices they suggest– I basically use what I have. The only other thing I do differently is I bake them in my oven instead of pan frying, I always have trouble with my veggie burgers falling apart when flipping them. If you bake them you don’t have to worry about flipping, I baked at about 400 until bottom started crisping, then broiled on low until top was done. These are wonderful, very tasty veggie burgers!! frequently, until softened, about 5 minutes; transfer to a large bowl. 2. In a food processor, purée 1 cup rice, lentils and egg until smooth. Transfer to bowl with vegetables, add remaining 1 cup rice and stir to combine. I follow the recipe in the link from Vegetarian Times, except the steak seasoning, I just add my own blend of favorite seasonings. I’ve added shredded carrot also. My favorite veggie burger of all time. You can pretty much add any veggies/mushrooms, whatever you want to the sauteeing process. Also, when I make this I make a huge batch of quinoa & beans, so we had these last night, tonight we’ll have chicken enchiladas with the extra beans, there’s enough to freeze a portion of beans/quinoa. Makes life easier to cook in large batches. This makes about 8 nice burgers so I freeze 4 of them. Or, you could cut recipe in 1/2. 2. Meanwhile, place onion and sun-dried tomatoes in medium nonstick skillet, and cook over medium heat. (The oil left on the tomatoes should be enough to sauteé the onion.) Cook 3 to 4 minutes, or until onion has softened. Stir in ¾ cup black beans, garlic, steak seasoning, and 1½ cups water. Simmer 9 to 11 minutes, or until most of liquid has evaporated. Pre-heat oven to 475. Line a rimmed baking sheet with aluminum foil and spray lightly with cooking spray. Set aside. Cut tilapia into strips by cutting in half lengthwise once and then again. Then cut in half horizontally to create strips. Place the egg in a large bowl and generously season with salt and pepper. In another bowl combine, panko, garlic powder, and olive oil. Dip the tilapia into the egg (shaking off an excess) and then into the panko. Press panko crumbs on to the fish to be sure that they stick and then place each breaded strip onto the prepared baking sheet. Pop in the oven and bake for 12-15 minutes or until cooked through. Sprinkle with a little more salt as soon as you pull them put of the oven. Serve along side Herbed Yogurt Sauce* and enjoy! Also submitted by Jennifer from the site Clean & Delicious: Realistic Recipes for a Nutritious Kitchen. I’ve made these, and they’re absolutely delicious! Cover a rimmed baking sheet in foil and place a wired cooking rack on top. Toss the chicken tenders in the pesto until all of the tenders are lightly coated in pesto. Thanks to Patricia for this recipe! I call this Crisper Casserole. When my crispers are overflowing with veggies (& my counter tops too) I just chop it all up & bake it at 400 until bubbly & veggies feel tender when forked. Then I add cheese to the top & finish cooking until golden brown. Goes with anything! 1.Preheat oven to 350 degrees F (175 degrees C). Spray a 9×13 inch baking dish with cooking spray. 2.Bring a large pot of lightly salted water to a boil. Add noodles and cook for 8 to 10 minutes or until al dente; drain. 3.Spray a large skillet with cooking spray and heat on medium-high. Saute onion and garlic for 3 minutes, or until onion is tender-crisp. Stir in broth and rosemary; bring to a boil. Stir in artichoke hearts and spinach; reduce heat, cover and simmer 5 minutes. Stir in pasta sauce. 4.Spread 1/4 of the artichoke mixture in the bottom of the prepared baking dish; top with 3 cooked noodles. Sprinkle 3/4 cup mozzarella cheese over noodles. Repeat layers 2 more times, ending with artichoke mixture and mozzarella cheese. Sprinkle crumbled feta on top. A super easy, different way to eat fish. Take any white fish you like, I use wild Alaskan cod, & slice it into strips. Coat the fish strips in olive oil & dust with taco seasoning, then cook on med heat til done, only 3-4 min if the strips are small. Serve on a bed of red cabbage, diced peppers & tomatoes, or any veggies you like. The red cabbage adds nice color, and doesn’t wilt like lettuce. I always add cilantro, and a squirt of lime juice. Serve on a warm corn tortilla, or flour if you prefer. Soooo easy, and delicious!! I used a variation on this sauce recipe. I didn’t have capers on hand so eliminated those, and used plain greek yogurt instead of both mayo & sour cream. You can really use any combination of those that you would like. It was really, really good! 1 hot pepper of your choice, seeded and minced (jalapeno is delicious, as are the cherry bomb poppers I used in this batch). 2. Squeeze the juice from one lime half into the fish taco sauce mixture, then whisk thoroughly. You’ll want the consistency of a pourable, creamy salad dressing. If still too thick, add more lime juice from the other half. If too runny, add sour cream. 3. Add all of the spices, whisking to mix thoroughly. Add the capers, minced pepper and cilantro, and whisk thoroughly. 4. Cover the bowl with wrap and refrigerate the fish taco for at least one hour — the longer the better. Your thin crust pizza looks so good. I especially love how easy it sounds to make. I’ll have to try it soon.